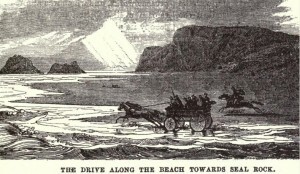 This is the name of a small group of rocky islands, lying in the Pacific Ocean, about twenty-seven miles west of the Golden Gate, and thirty-five miles from San Francisco. 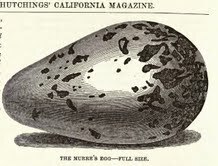 These islands have become of some importance, and of considerable interest, on account of the vast quantity of eggs that are there annually gathered, for the California market; these eggs having become an almost indispensable article of spring and summer consumption, to many persons. 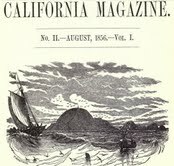 To the dwellers of an inland city, there is music in the ever restless waves, as they murmur and break upon the shore ; but, to sail upon the broad heaving bosom of the ocean, gives an impression of profoundness and majesty that, by contrast, becomes a source of peaceful pleasure; as change becomes rest to the weary. There is a vastness,around, above, beneath you, as wave after wave, and swell after swell, lifts your tiny vessel upon its seething surface, as though it were a feather, a floating atom upon the broad expanse of waters. 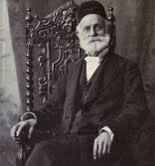 Then, to look into its shadowy depth, and feel the sublime language of the Psalmist : Lord, how manifold are thy works,! in wisdom hast Thou made them all: the earth is full of thy riches. So is this great and wide sea, wherein are things creeping innumerable, both small and great beasts. There go the ships. There is that leviathan, whom Thou hast made to play therein. These wait all upon Thee : that Thou mayest give them their meat in due season. Thou openest thy hand, they are filled with good. Thou hidest thy face, they are troubled. “Yonder blows a whale!” cries one. Reader, were you ever seasick? If your experience enables you to answer in the affirmative, you will sympathize somewhat with the poor subject of it. Yonder may be this beauty, and that wonder, but a don’t-careishness comes over you, and if all the remarkable scenes in creation were just before you,I don’t care is written upon the face, as you beseechingly seem to say : Pray don’t trouble me, my hands are full.” “Whales, sea gulls, porpoises, and even the white, foamy spray, that is curling over Duxbury Reef, are alike unheeded. “How are you now ?” kindly asked our good natured Captain, of the one and the other. The mere mention of anything to eat or to drink is only the signal for a renewal of the sickness. “Thank goodness! I feel better,” says one, after a long spell of sickness and quiet. ” So do I,” says another ; and, just as the ” Farallones ” are in sight, fortunately, all are better. voyage to feel our feet standing firmly on terra firma. 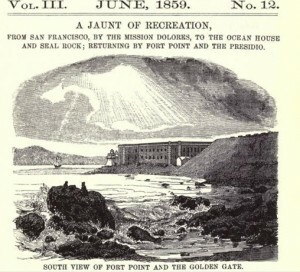 sail of San Francisco, yet not be the resort of nearly every seeker of pleasure, and every lover of the wonderful. As these made the loudest noise, and to us were the most curious, we paid them the first visit. When we were within a few yards of them, the majority took to the water, while two or three of the oldest and largest remained upon the rock, standing guard over the young calves, that were either at play with each other, or asleep at their side. As we advanced, these masses of ” blubber ” moved slowly and clumsily towards us, with their mouths open, and showing two large tusks, that were standing out from their lower jaw, by which they gave us to understand that we had better not disturb the repose of thw juvenile lions,” nor approach too near ; or, we might receive more harm than we intended, or wished. But the moment we threw at them a stone, they would scamper off and leave the young lions to the mercy of their enemies.